Cacao trees belong to the family Sterculiaceae. The common cacao tree is classified as Theobroma cacao. Being of a very delicate and sensitive nature, the cacao tree needs protection from wind and requires a fair amount of shade, especially in its first four years of growth. With pruning and careful cultivation, the trees of most strains will begin bearing fruit in the fifth year. A perennial that yields several harvests annually, it was first cultivated in South America, introduced into Europe during the 16th century and today grown chiefly in western Africa. The average cacao tree attains a height of about 20 feet, has shiny leaves as long as 12 inches and small pink flowers on the trunk and older branches. Only about 30 of the 6000 annual blossoms eventually bear seeds. Commonly called cocoa beans, the seeds are surrounded by a yellow or reddish-brown pod up to 12 inches long. Cocoa beans are either purple or off-white and resemble almonds. The processing of the cacao seeds, better known as cocoa beans, is quite complex. To make the cocoa bean into the dark, delicious substance we call chocolate, it must go through an involved process. Fermenting the fruit harvest takes 3 to 9 days, during which the heat drys the seeds and turns them brown. The enzymes activated by fermentation bring out the chocolate flavor. The beans are then dried in the sun and cleaned in special machines before they are roasted. Roasting loosens the outer shell which separates the cocoa bean shell from its center or "nib". The nib is the source of the cocoa and chocolate products. The nibs are milled, a grinding process that transforms them into an unsweetened chocolate "liquor". The liquor contains 50-55% cocoa butter and is the basis of chocolate products. Cocoa butter is produced by extracting it from the chocolate liquor. The remains is a solid mass called "press cake". Cocoa powder is made by pulverizing the press cake. When cocoa powder is prepared, most of the cocoa butter is removed in the manufacturing process. After the fat is separated and the residue is ground, small percentages of various substances may be added, such as starch to prevent caking, or potassium bicarbonate to neutralize the natural acids and astringents which makes the cocoa easy to dissolve in liquids. 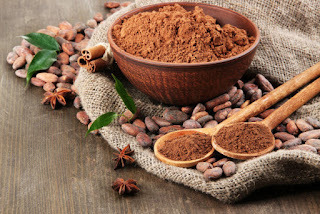 Cocoa has a high food value, containing as much as 20% protein, 40% carbohydrate, and 40% fat. It is also mildly stimulating because of the presence of theobromine, an alkaloid that is closely related to caffeine. Having a high proportion of fat in the bean kernels (cocoa butter) makes it a useful product to use in medications, cosmetics and soaps. The beans are sold in international markets. African countries harvest about two-thirds of the total world output; Ghana, Côte d'Ivoire, Nigeria, and Cameroon are the leading African cocoa producers. Most of the remainder comes from South American countries, mainly Brazil and Ecuador.